I was watching the Iron Bowl on Saturday where at the half Alabama was down 26-21. And on the first drive of the second half, Blake Sims threw his third interception of the game. 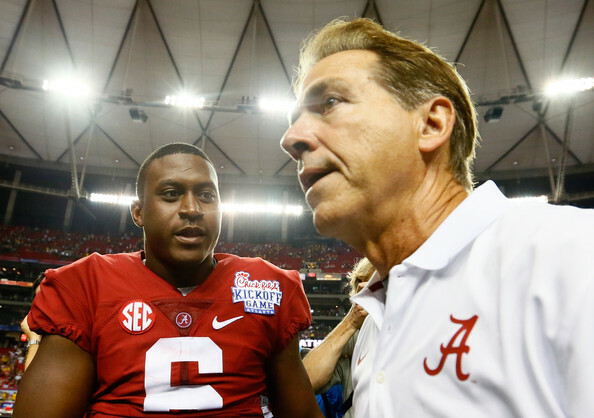 Blake Sims then became the first quarterback under Nick Saban at Alabama to throw 3 interceptions in a game. And on the sideline the back-up quarterback, Jacob Coker was shown with his helmet on warming up. For the season in 11 games, Sims had thrown 4 total interceptions. In the Iron Bowl on Saturday he threw 3 in 31 minutes. Auburn went right down the field and scored to make it a daunting 33-21 score. But, Saban left his star quarterback in the game. And they eventually won the game 55-44 and Sims had a final stat line where he went 20 of 27 for 312 yards with the 3 interceptions and 4 touchdowns. Saban was right. Fast forward a day to Sunday in Buffalo. The snow had finally been cleared, but the controversy for the browns had just started to pile up. In the 4th quarter of their loss to the Buffalo Bills Cleveland Browns head coach Mike Pettine decided to pull starter Bryan Hoyer for back-up Johnny Manziel. And yes Manziel lead them to their only touchdown of the game with a 10 yard run. I would argue that Hoyer is the biggest reason the Browns are a very respectable and somewhat surprising 7-5. Their starting running back, Ben Tate was released, their best receiver Josh Gordon was suspended for the majority of the season, and their best receiving tight end, Jordan Cameron has been out for quite a few games as well. Hoyer has been all they have had, yet he has guided them to 7 wins. I know Hoyer has thrown 6 interceptions in his last 4 games with 5 of them coming in the last 2 weeks. 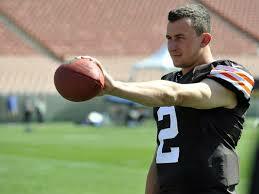 But Manziel had the chance to show the Browns brass for two series in the game just what he could do. One of them he did lead the team down the field and score a touchdown. But the other he messed up the snap count as the ball rolled around on the field. He was lucky the play was ruled a forward pass. But, the drive ultimately stalled anyway. So he was effective 50% of the time. I did not understand the timing of the switch at quarterback. There was no way the Browns were going to win that game. What good did it do to bring Johnny Football into a game for less than a quarter other than to cause controversy and division in the locker room? If they stick with Hoyer, the message is, “we are trying to win now” especially since his contract expires at the conclusion of this season. If they go with Manziel, the message is, “we are sacrificing our good start to this season so we can see if we can win next year after Hoyer leaves.” They are tied for second place in their division currently. Going with Manziel now does nothing for your team this season, and for that reason I believe that Pettine was wrong. Next Story → Can Ohio State Overcome Everything?